That’s how Wireless Nation Founder and CTO Tom Linn was described recently by the National Business Review. As I sit down with him for lunch in a Takapuna restaurant I have to agree that sums him up to perfection. He’s charismatic and personable, with a gentle but firm style. It was in 2002 that Tom realised that he was never going to get a university education in his native Myanmar due to the military dictatorship having closed down the colleges. So having looked around for a country with a reputation for freedom, Tom chose New Zealand. 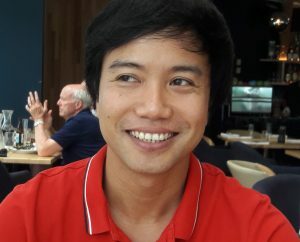 Fast forward a few years and armed with a Masters in Engineering from Auckland university, specialising in Artificial Neuron Network, Tom started Wireless Nation. There were two drivers. First, his frustration in not being able to get naked broadband (internet without also paying for a landline phone) in his Auckland apartment. “Telecom ruled the country in those days,” he says. 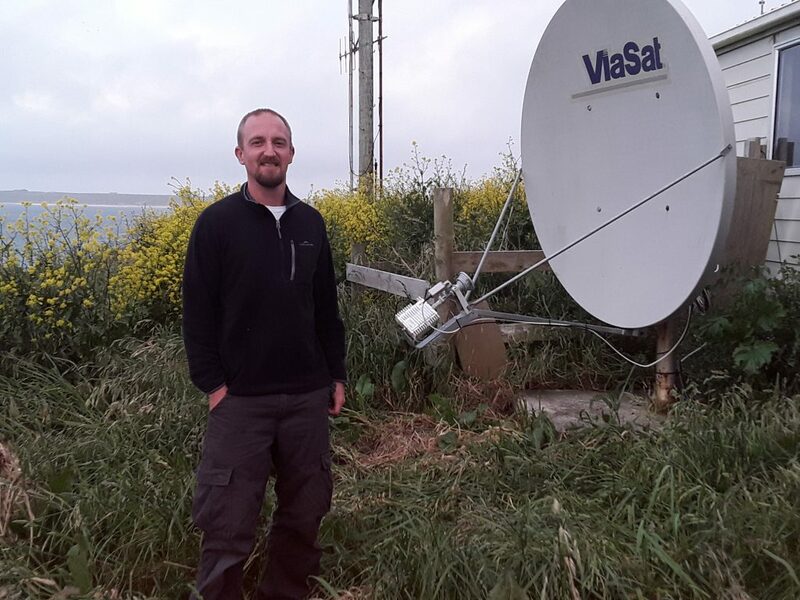 Second, a friend farming in the Waikato could not get any broadband at all, leading Tom to realise that for many parts of rural New Zealand high quality satellite was a highly viable option. So at the Waikato Home and Garden Show in 2006, Tom launched satellite broadband with the support of business partners and investors in Hamilton. It wasn’t all smooth sailing from day one. Gamers quickly made it known that latency was unacceptable in their world which ruled out satellite, so reselling Kordia Extend fixed wireless product was introduced as a successful alternative. But with that issue solved, Wireless Nation expanded quickly across rural New Zealand from a Waikato stronghold. The company later introduced 3G and 4G fixed wireless nationwide through the government-funded Vodafone RBI-1 network. Meanwhile the apartment sector became the second market for the business. The company worked with apartment block Body Corporates to bring “fibre to the basement” years before the government introduced its Ultra Fast Broadband. Most owners were very keen. However, there’s always an exception – even today there is a minority of apartment complexes where fibre has been rejected for aesthetic reasons, mostly in top-end, student accommodation or heritage properties. More recently, motor homes have entered the picture. The NZ Motor Homes Association has a whopping 80,000 plus members, many of whom spend most of the year living in their vehicles for a few weeks at each location and then moving on. Broadband can be a challenge – campers want to stream Netflix as much as anyone but existing service plans didn’t contemplate the possibility that users would be forever moving to a different town or rural site. So Wireless Nation became the Association’s official provider and offering an affordable wireless broadband service to thousands of happy campers . But it was the isolated Chathams that captured the interest of many WISPs when Wireless Nation got involved around 2013. With no undersea cable and little prospect of one, the best solution was satellite backhaul and a WISP last mile service. And it was there that I travelled to see the difference Wireless Nation is making. Its my first trip to the Chathams. The 1950s Air Chathams Convair flight out of Wellington is pretty much full. About half the passengers appear to be locals returning. The rest are obviously visiting, mainly in relation to provision of infrastructure – IT people, engineers, DoC rangers, other government officials, and me. Driving from the airport gives a first impression of the landscape. Flat, lots of scrub and tussock, few trees, unsealed but well-maintained roads, sparse habitation. The declining population, sinking through 600 on Chatham Island and 40 on Pitt, is a serious issue. In earlier times when kids reached secondary school age parents sent them to boarding schools In Christchurch, but these days they move the whole family across to the mainland. They don’t return. My Android phone is getting an unaccustomed 2 day rest – there’s zero cellular coverage in the Chathams. Those lucky enough to be on 2degrees can get voice over WiFi when they’re in range of a WiFi connection, but there is nothing for Spark nor Vodafone customers. 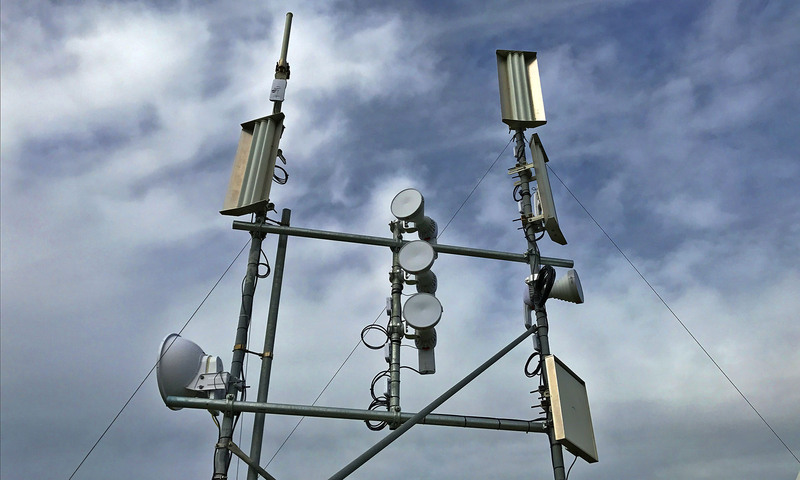 The government has funded the Rural Connectivity Group to build some towers in the medium term future, but the backhaul will still be satellite. The Internet is another matter. Since Wireless Nation “adopted” the Chathams many businesses have Internet almost at city standards, the speeds constrained only by the satellite backhaul. However, in my room at the popular Hotel Chathams I’m on Farmside satellite Internet. Speeds on some occasions are adequate, but then without warning go into freefall. Hopefully as Wireless Nation roll out more extensively that will change. 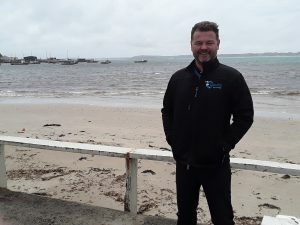 “Here on the Islands we’re 45 minutes ahead of the rest of New Zealand in time, but 20 years behind in connectivity,” says Iain Torrance, CEO of the Chatham Islands Enterprise Trust. Sitting with Iain – a telecommunications veteran with history in the UK, internationally and TelstraClear in New Zealand – I get to understand the challenges, priorities and solutions surrounding development of the Chathams. We’re in his unpretentious office a few minutes out of Waitangi. The Trust is one of four organisations working on development, he tells me. Central government formed it in 1991 after the Council went broke. Owned by all Chathams residents, the Trust is a public benefit entity that controls the airport, the new $50 million Waitangi wharf, electricity supply, fuel, some fishing quota that it leases out, and the shipping service. Beyond those overtly commercial interests its mandate is to work for the social and economic benefit of the Chathams. Ever since an initial government grant at the time of formation it has been self-funded. The other three economic development stakeholders are the Chatham Islands Council, the Moriori iwi Hokotehi, and the Maori iwi Ngati Mutunga. When it comes to the development priorities, the four agencies are in general agreement. Top priority is the airport – that seems to be on track with a 500m extension of the runway needed to accommodate Class 4 jets including the B737. Air Chathams have bought a B737 simulator from Air New Zealand ready for the phase out of the aged Convairs which have serious limited ability to support a thriving trade in live crays and other fish to Asia. Second priority is renewable energy to replace the current diesel generators on which the electricity supply depends. Third priority is 21st century telecommunications – Internet and cellular. Within the Islands the current copper network is way past its end of life, expensive to run, and far short of the needs of the Islands today. And connectivity between the mainland and the Islands is satellite only – way short of 21st century needs. I’m left wondering why, while New Zealand is investing $22.2 million to connect Tokelau’s atolls to the world with undersea fibre optic cables, our own Chathams are left with 20th century satellite with no improvement in sight. Yet Iain Torrance concedes that its hard to justify an undersea cable for a community while it has a declining population. “We need to stop talking about the technology and talk about outcomes,” he urges. “We need to get across that our people want to work, access information, be able to use Facebook, and do school homework on the Internet, like mainland New Zealand. Safety is a big factor too – the ability for workers on isolated sites to be in contact when they’re out on a job. Fundamentally it’s about the social and economic benefit to our remote community. Its quality of life. “Within the Trust we’ve had a silo mentality when it comes to technology. There’s a server here that our electricity company can’t access. So we’ve brought in a consultancy to spec our IT needs and consolidate them. Meanwhile Wireless Nation is filling a vital need. There’s a three-year window for Wireless Nation to consolidate and establish themselves as the preferred supplier, he says. Key users on the Chathams underline the crucial importance of telecommunications. Rana Solomon heads the emergency management operation for the Chathams Council. 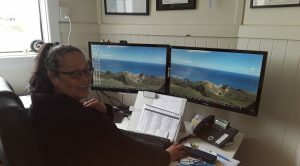 She works a lot from home, monitoring a stream of tsunami or earthquake warnings and other alerts from GNS or NIWA that could pose a threat to the low-lying Islands. 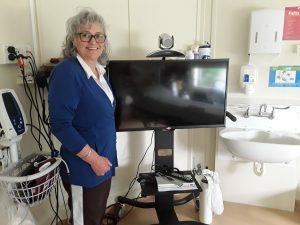 When the Council team are in isolated areas or off the Islands they need to be accessible remotely. Luckily now she has Wireless Nation at home on an unlimited plan, but the big challenge is how to notify the Islands population if a big one is coming. “We can’t rely on the basic phone system,” she explains, “because its only capable of handling 15 or 20 conversations at a time. So we rely heavily on Facebook – in an emergency, or the threat of one, we can easily have 10,000 people looking at our page. So I carry a mobile and use it to access people’s home WiFi systems when I’m passing a home or business. I don’t use it lightly because some people’s plans are very data-constrained. Down the road, Monique Hagedoorn is a recent arrival. 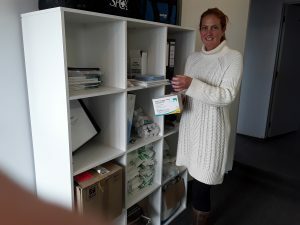 As the first SPCA person on the Island she works with South Island inspectors dealing with animal welfare. She’s also a qualified veterinary nurse and practices as a volunteer in her spare time. “I’ve got a 2degrees phone provided by MPI,” she tells me. “Luckily 2degrees allows voice calls across WiFi, though I have to be within a few metres of the office. But the broadband is awful – Skype is unsatisfactory and often goes down. And no way will the home TV get Netflix. Over a beer at the Henga resort Jason Somerville, Commercial Solutions Manager for Wireless Nation, is optimistic about changes to come. “The lodge here at Henga now has unlimited broadband which will be great for guests,” he says. “Before now many tourist places didn’t offer Internet to guests because of the cost. There are lots of businesses waiting for affordable, unlimited Internet – at last we are bringing it here. The biggest hurdle is often the setup cost but its surmountable for most. And Jason should know – his current visit includes providing public WiFi at the airport among other jobs. Jason’s a huge fan for his company. He enthuses about modern satellite. There’s almost literally nowhere, in any part of New Zealand, that the company can’t connect. He quotes town centres in the Waikato, a marina in Wellington and education applications as recent examples. “Otorohanga is a great example,” he says. Free community WiFi in the town centre is a reason for tour buses to stop. It enables CCTV in the town centre to reduce crime. It’s the sheer diversity of markets that makes Wireless Nation a successful company. How big is it? Tom Linn wont quote the customer count – but he does let slip that the business is about to become liable for the Government’s Telecommunications Development Levy, which has a threshold of $10 million turnover. That’s certainly not small. Tom is not about slowing down. He’s brought well-respected William H. Smale QSM, known as Bill, of Smales Farm Technology Park fame in as managing director. He’s spoken publicly of turning Wireless Nation into a multi national. Back in Myanmar he comes from a highly entrepreneurial family. Finishing the coffee after an excellent lunch in Takapuna I have no doubt he will succeed. Tom has a very strong business ethic – “to me its not just about making money; its about pursuing our passion without limits.” He runs a happy and motivated team and encourages location-independent working. He’s a natural deal-maker, has a gentle footprint on the planet and comes across as a genuinely nice guy. Lunch again? My shout next time.